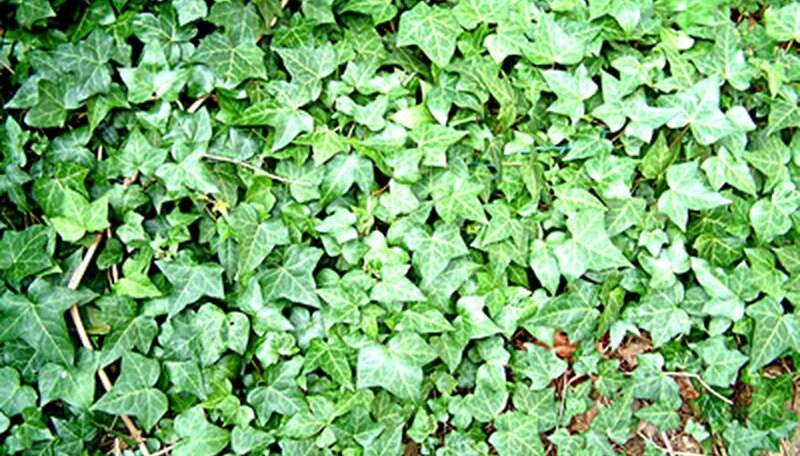 English ivy (Hedera helix) is an evergreen ground cover native to Europe. It grows best on the shady east and north side of structures in moist soil. Although it spreads to 10 feet over the ground, it can climb up brick buildings and trees as high as 20 feet or more. The aerial rootlets can damage masonry, and the thick growth gives cover to pests that can adversely affect the health of trees. When English ivy grows thickly and spreads beyond its borders, you may decide to transplant, or relocate, some of the ivy from one area to another. Prepare the area where you are going to transplant the English ivy by removing all grasses and weeds. If the soil is packed hard, turn it with a shovel to loosen it. Spread a 1/2-inch layer of compost over the area, then rake it smooth and dampen with a gentle stream of water. Locate the pieces of English ivy that are well-rooted into the ground. Every leaf node, or area where two leaves sprout along the vine, has the potential to set out roots. Look for a length of vine with numerous leaf nodes that have viable root systems. Clip long lengths of ivy away from the larger planting with a pair of hand shears. With the hand shovel in one hand and the length of ivy in the other, slowly pull the ivy from the ground using the hand shovel to loosen the roots around each leaf node where there are roots attached to the ground. Continue using this method until you have the amount of English ivy needed for the new location. Cut the English ivy into 8- to 10-inch sections by cutting between leaf nodes. Then set the sections of ivy over the new planting area 6 to 10 inches apart, depending on the amount of ivy you have to transplant. Cover the sections of ivy with a 1/2-inch layer of dirt mixed with compost. Be sure the leaf nodes where the roots have contact with the soil in the new location are covered with soil. Moisten the soil and the new sections of English ivy and keep moist until you see new growth. Once the ivy is actively growing, add another 1/2-inch layer of compost over the ivy roots and planting area and water regularly, keeping moist, but not wet. Although English ivy thrives in moist well-drained soil, you can kill it by overwatering and causing the root systems to rot.